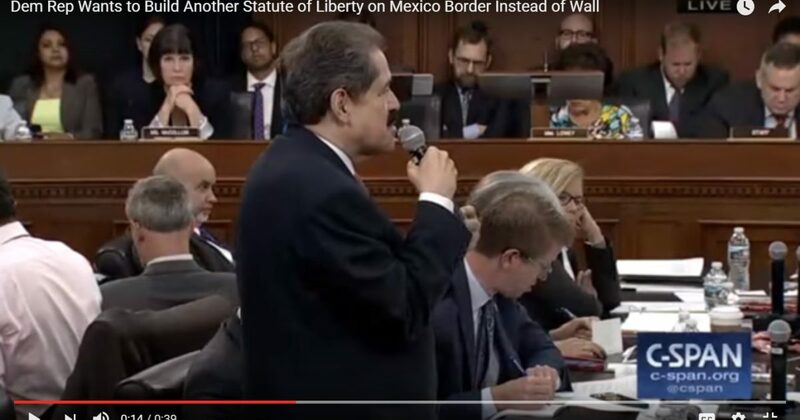 Rep. José Serrano (love your peppers), a Democrat from New York is proposing that the United States abandon President Trump’s wall and build a second Statue of Liberty on the Mexican border instead. The proposal came at a Homeland Security markup. I do not oppose a second Statue of Liberty on our southern border. In fact, I would put it slap on top of President Trump’s very high, impenetrable wall so that it can be seen for miles, just below the statue a large gate allowing LEGAL entry of vetted, documented seekers of citizenship. Call it Ellis Island South. That is what Serrano is failing to recognize. The Statue of Liberty was a beacon to LEGAL immigrants who were processed through Ellis Island. We cannot have a porous, unprotected border and hope to survive as a nation. It is an invitation to invasion. And there can be no Ellis Island 2,000 miles wide from San Diego to Brownsville. We need a wall with entry control points here and there! “This country should never build a wall to keep people out,” Serrano said, according to NTK Network. “On the contrary, build another Statute of Liberty on the southern border. That’s our message to the world, that statute, not the wall,” he proposed. Serrano listed various problems that he saw with Trump’s proposed border wall, claiming it would be “a waste of money” and “divide” the United States. Serrano was one of several Democratic congressmen to not attend President Trump’s inauguration.